SUZHOU, China, Oct. 29, 2018 /PRNewswire/ — PEACE Cable International Network Co., Ltd, a subsidiary of HENGTONG, is pleased to announce today, in conjunction with Huawei Marine Networks Co. Ltd, that the PEACE Cable project has entered into the cable and material manufacturing stage. 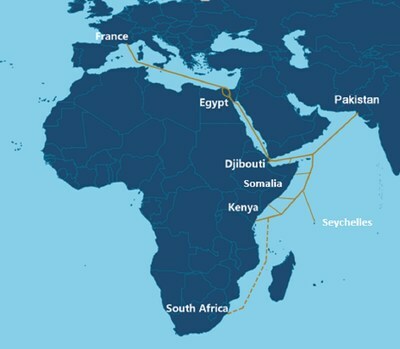 The PEACE Cable system spanning 12,000 km will connect Asia, Africa and Europe and is targeted to be ready for service in the first quarter of 2020. Once completed, the high-speed, 200G, 16Tbps per fiber pair PEACE Cable system will offer the shortest routes from China to Europe and Africa, dramatically reducing latency and providing a new information expressway for interconnection between the regions. The system’s open access and carrier neutral data centers will have a big impact in the countries connected to the cable system. This project’s cable being used are from Hengtong Marine Cable Systems, whose submarine cables have been applied globally in recent projects such as the FOA project in Chile, the PNG project in Papua New Guinea, Avassa project in Comoros, the NaSCOM project in the Maldives, the Megacable project in Mexico, and the IGW project in Peru. PEACE Cable Project is a privately owned cable system of 12,000 km and provides open, flexible and carrier-neutral services for its customers. The system design will adopt the latest 200G technology and WSS technology, which provides the capability to transmit over 16Tbit/s per fiber pair, servicing growing regional capacity needs. This network will provide a cost-effective, diverse route for the escalating demand for capacity among Asia, Africa and Europe, and the topology will substantially reduce network latency by adopting shortest direct route connectivity and enhancing route diversity between them.